Please join us for Holy Week services this year as we remember the life, death, and resurrection of Jesus Christ. 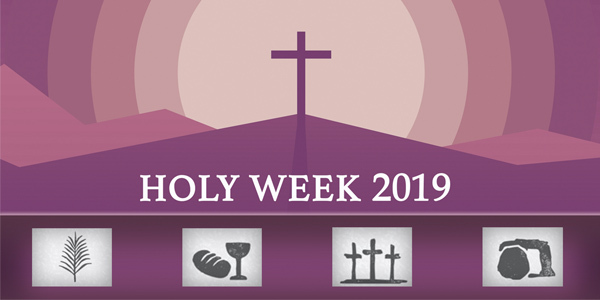 Holy Week is the remembrance of Jesus passion, death, and resurrection that is celebrated by the church throughout the world. It begins with Palm Sunday which commemorates Jesus’ triumphal entry into Jerusalem. Maundy Thursday is the remembrance of the evening meal Jesus had in the upper room in which he initiated the Lord’s Supper or Holy Communion. Good Friday observances mark Jesus’ crucifixion. Easter Sunday is the celebration of Jesus’ resurrection. While Holy Week has many different parts, together they mark the most important days of the Christian year. Join us for Sunday services at 8:30(traditional) and 10 a.m.(contemporary). Our Maundy Thursday service will be held at 7 p.m. on April 18. The sanctuary will open for communion and contemplation from noon – 1 p.m.
Good Friday service, April 19 at 7 p.m.
April 21 at 8 a.m., 9:30 a.m., and 11:00 a.m.
Childcare is available for all services except Easter Sunday at 8 a.m.